Akshara is an Indian word for 'letter.' In Sanskrit, the Indian classical language, akshara means 'indestructible,' or that which cannot be destroyed. Keeping this in mind, we see that the meaning behind the word 'letter' (akshara) is linked to the concept of language becoming indestructible once it materialises through writing. It is the 'letter' that gives the language permanence and eternity. 'Akshara, Calligraphy in Arts,' an exhibition held between 15 and 21 April at the Hanager Arts Centre in Cairo, is a part of India on the Nile, the first festival dedicated to bringing the many facets of Indian arts to Egyptian audiences. The crafts exhibition held at Cairo's Hanager Arts Centre is a fraction of The Indian Arts Journey by The Dastkan Haat Samiti, in which the NGO collects arts and crafts from dozens of artists, from different regions in India. 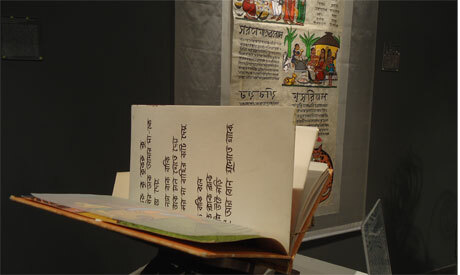 As such, 'Akshara, Calligraphy in Arts' celebrates the script by fusing the art of calligraphy with handicrafts. A carved wooden elephant statuette by Mahavir Prasad Bondwai carries scripts of Devanagari (or Nagari), a writing system known across all of India and Nepal, known for the horizontal line that runs along the top of the letters. Nagari is also used in numerous other works, including a highlight of the exhibition: a wooden book cover. Coming from an Indian Northern State called Uttar Pradesh, artist Arshad Kafeel inlaid in wood words of an Indian poet, an episode from the country's profound history. A Bengali water-painted script joined in Kalighat style with rounded figures and other forms decorates a wall hanging done by Sanawar Chitrakar. Being a writing system used primarily in Bangladesh, Tripura and West Bengal, at first sight the Bengali font resembles Nagari script, except that it is less rigid and less blocky. Meanwhile, in a hand-painted Kalamkari (cotton fabric), artist Jonnalagadda Nirangans interweaves Telugu scripts (a language predominantly spoken in Andhra Pradesh, located in South India, one of the 28 states of the country) within a tree overlooking two peacocks representing lovers. Urdu, Bengali, Devanagari, Tamil, Telugu, Kannada, Malayalam (known as 'round writing') scripts... Scripts painted over paper and textiles, calligraphy carved or inlaid in wood, clay; works on metal, pottery, stone... the Hanager Arts Centre exhibition hall breathes with inspiring pieces of the creative minds of India captured in a museum-quality art. But the exhibition is not limited to creating a pure documentation of 'indestructible' letters. Neither is it merely a display of a palpable testimony to the large amount of the languages of India, versifying culturally the nation across 22 official languages and many more regional spinoffs. 'Akshara, Calligraphy in Arts' is also an inspiring display of art and concepts, as it keeps translating itself in a multitude of forms. Topped with projections and video work, the exhibition confronts the viewer with a multitude of perceptions of 'letter' (akshara), freeing the scripts from traditional notions of a tangibility. 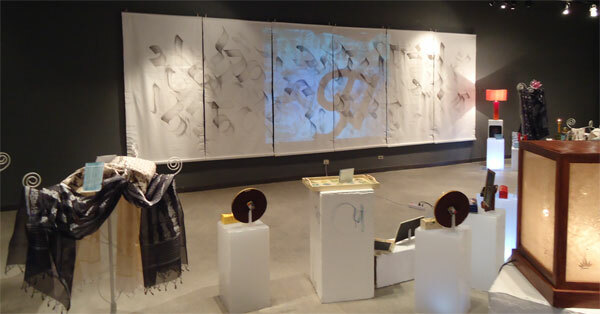 We find projections of akshara flowing freely on canvases, an artwork by professional calligrapher Rajeev Kumar and a projection titled Aksharakaram, showing a classical dance movement where dancers, Navtej Johar and Justin McCarthy, join transcript with movement – a dance with an imaginary calligraphy. Leaving the 'Akshara, Calligraphy in Arts' exhibition hall to the noise of Cairo, one can't help but contemplate the values that old civilizations can bring and reinvent, while infusing the modern fast-paced life with a fresh and vibrant spirit. 'Akshara' is definitely an exhibition not to be missed, and one of the most interesting displays held by the Hanager Arts Centre in recent months. Akshara exhibition's organizers develop profound links with Egyptian artists. One of the demonstrations of this procedure is through the canvas produced jointly by an Indian and Egyptian calligraphers. Other efforts aim at creating close contact with the Egyptian calligraphers as well as artisans. Let us not forget that sharing skills and experiences remains one of the core objectives of the festival 'India by the Nile'. Greetings.. I have in my possession a silk tapestry wall hanging I believe to be of great antiquity. I was wondering if there is anyone whom I can send images of it too that may be able to assist me in translating the script woven into its borders. The calligraphy is very similar to Nagari script I have seen. Any assistance at all would be warmly welcomed. Regards. Simon. Dear Editors, I read your newspaper along with al-Ahram weekly online edition regularly. Despite the fact that the US is my home, I have been missing my country of birth. Your news, reporting on Indian cultural days, i.e. Nile Festival in Cairo, have made me very nostalgic. I am about to pack my bags and go to Cairo (Insha 'Allah) one day. Thank you again for your well-balanced reporting on events as they transpire in Cairo and the MENA region. Wishing you success, I remain respectfully yours, Liladhar University of California.